Hoodoo took its roots very early on in African history, however the first record of it being a way of life dates back to the late 1700’s. Hoodoo is derived from spiritual knowledge, herbal medicines and magic that were, and still are, thought to be the most powerful healing forces. Although Hoodoo and Voodoo are commonly confused and share some similarities; they are indeed different. Hoodoo is a religion that places great emphasis on the use of the earth’s natural herbal products and spirits to heal an individual. 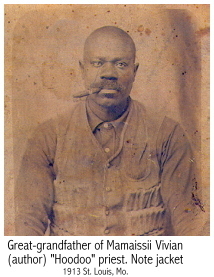 It was in the late 1800’s that Hoodoo was introduced within the Mississippi Delta during the slave trade. Unfortunately, the word “Hoodoo” was made a noun and meant to place an evil spell on someone. It is often used out of context even today. Additionally, it was spread excessively throughout Europe during this same time period for similar reasons. Those who practiced Hoodoo also practiced Christianity. 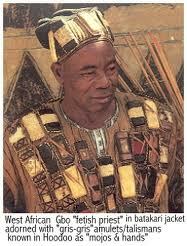 This was mainly so they could hide their Hoodoo practices and not get in trouble for dabbling with the "dark magic." It is very common to see Hoodoo figures coupled with symbols of Christianity. The pictures above represent historical Hoodoo figures. 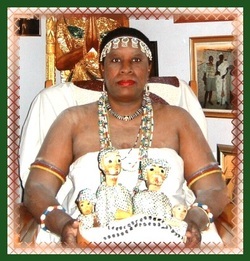 The woman is Mama Zogbé. The two men above are both considered healing men. As you can see, they keep their herbal remedies on their vests at all times in case they need to heal. 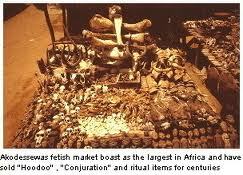 The final picture is an array of various ritual items that were commonly used in Hoodoo magic ceremonies.